With Bible KidVentures: Stories of Danger and Courage you the reader are taken right into the middle of the action of your favorite Bible stories. In each story, you are the main character and what happens is completely up to you! Through your choices you can receive great rewards, get into big trouble, or even lose your life. It's your turn to witness Bible history in action by entering the story and choosing your own path. 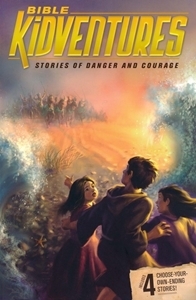 The four stories included in this edition are: Deadly Exhibition, Trapped!, Attack!, and Escape!. Recommended for ages 10 to 14 years.